Harper Perennial Modern Classics, 9780060736262, 528pp. A special 75th anniversary edition of the beloved American classic about a young girl's coming-of-age at the turn of the twentieth century. From the moment she entered the world, Francie Nolan needed to be made of stern stuff, for growing up in the Williamsburg slums of Brooklyn, New York demanded fortitude, precocity, and strength of spirit. Often scorned by neighbors for her family’s erratic and eccentric behavior—such as her father Johnny’s taste for alcohol and Aunt Sissy’s habit of marrying serially without the formality of divorce—no one, least of all Francie, could say that the Nolans’ life lacked drama. By turns overwhelming, sublime, heartbreaking, and uplifting, the Nolans’ daily experiences are raw with honestly and tenderly threaded with family connectedness. 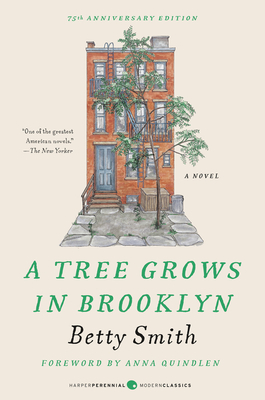 Betty Smith has, in the pages of A Tree Grows in Brooklyn, captured the joys of humble Williamsburg life—from “junk day” on Saturdays, when the children of Francie’s neighborhood traded their weekly take for pennies, to the special excitement of holidays, bringing cause for celebration and revelry. Smith has created a work of literary art that brilliantly captures a unique time and place as well as deeply resonant moments of universal experience. Here is an American classic that "cuts right to the heart of life," hails the New York Times. "If you miss A Tree Grows in Brooklyn, you will deny yourself a rich experience." Betty Smith (1896–1972) was a native of Brooklyn, New York. Her novels A Tree Grows in Brooklyn, Tomorrow Will Be Better, Joy in the Morning, and Maggie-Now continue to capture the hearts and imaginations of millions of readers worldwide.